On April 2, Mediaite reported  that Sinclair was set to debut America This Week, a new weekly program hosted by Eric Bolling. The first episode would include appearances by several members of the Trump inner circle: former Trump strategist Steve Bannon, former Trump campaign manager Corey Lewandowski, and 2020 campaign adviser and the president’s daughter-in-law Lara Trump. Bolling is a newly official Sinclair personality who has been making appearances on its national programming for months, and he also hosts  a streaming show with right-wing outlet BlazeTV. He was previously a host and co-host at Fox News -- where he regularly trafficked in conspiracy theories, misogyny, and race-baiting -- but he left in 2017 amid reports that he sent multiple colleagues unsolicited images of genitalia. Bolling then led a discussion with former Trump adviser and Sinclair contributor Sebastian Gorka  and Democratic strategist and frequent  Fox News guest  Jonathan Harris, and another with former Trump campaign manager Corey Lewandowski. 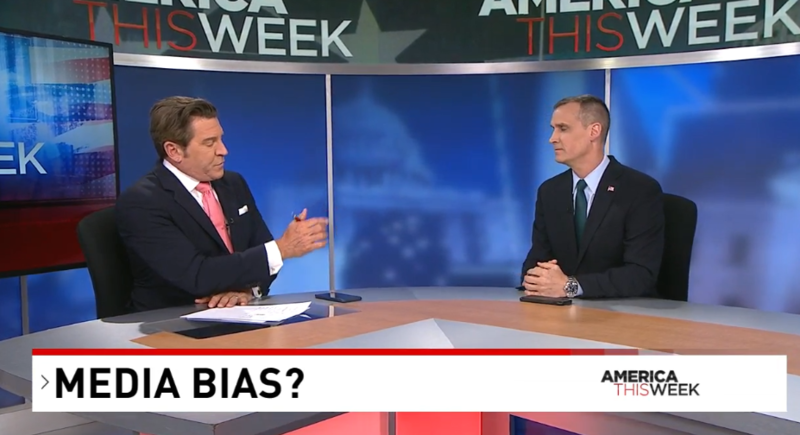 Both Gorka and Lewandowski addressed  supposed  mainstream media bias  against the president. 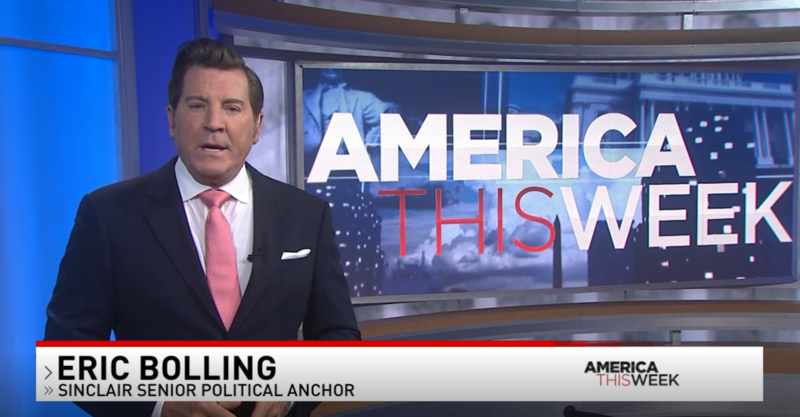 Later in the episode, Bolling featured a report about Rep. Ilhan Omar (D-MN) from James Rosen , another former Fox News employee. He also played a pre-taped interview with presidential daughter-in-law and current Trump campaign adviser Lara Trump , which touched on the idea of media bias against the president. 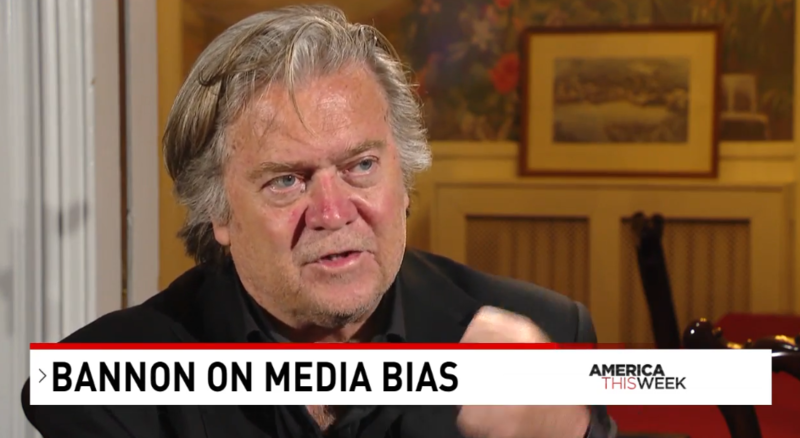 The show also aired an interview at the “Breitbart Embassy ” with former Trump adviser Steve Bannon discussing, again, media bias  against Trump, the concept of a “deep state,” and Bannon’s thoughts about various public figures including former FBI Director James Comey, progressive philanthropist George Soros, Rep. Alexandria Ocasio-Cortez (D-NY), the pope, Trump, and himself. Bolling then introduced his interview  with Rep. Devin Nunes (R-CA) about “the Russian collusion illusion.” Nunes spent the last portion of the interview discussing the false  talking point  that conservatives are being “shadow banned” or otherwise discriminated against by social media platforms and his lawsuit against Twitter . 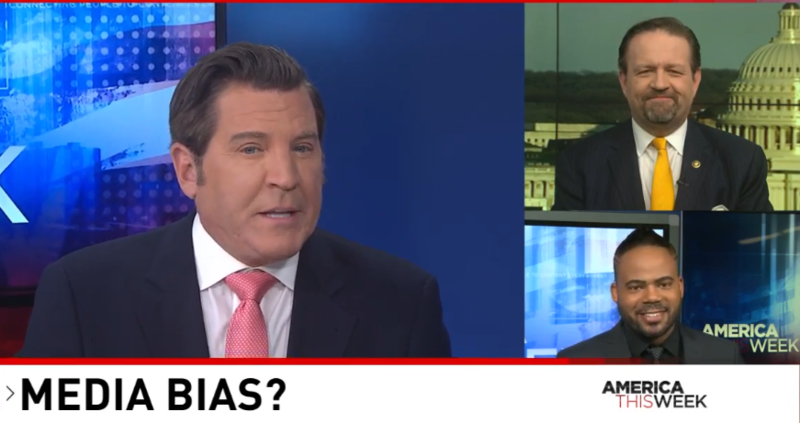 Bolling conducted a long interview with former President Barack Obama adviser Austan Goolsbee (also a frequent Fox News guest ), in part to discuss whether a good economy ought to be credited to Obama or Trump. 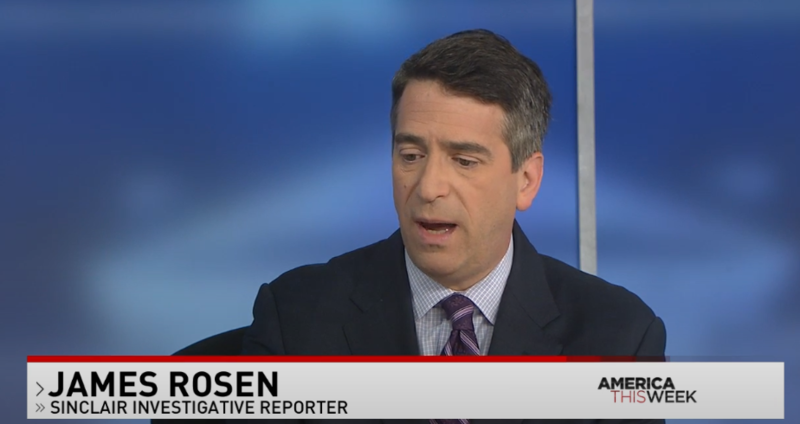 There was another report from Rosen, this time focused on Attorney General Bill Barr’s misleading statements before Congress about “spying ” on the Trump presidential campaign in 2016. And there was a discussion about Hitler apologist and far-right personality Candace Owens  and “nationalism” between Sinclair chief political commentator Boris Epshteyn  and Sinclair commentator Ameshia Cross. Next week , Bolling said , will feature an interview with the president. The first two full episodes of America This Week were posted on local  Sinclair  station  websites  on April 3 and April 10. While initial  reporting  suggested the show would air on Sinclair news stations across the country weekly, thus far it appears to have been distributed primarily online, with short excerpts aired on TV. 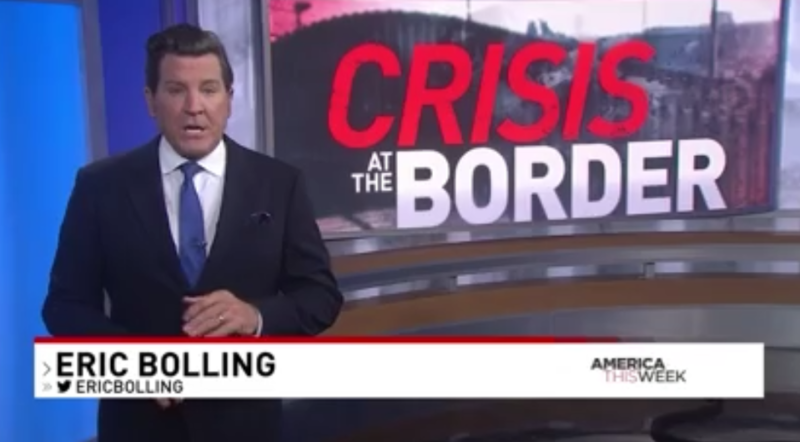 The first episode of Bolling's show does not appear to have aired in full on any local news stations -- at least not on any the larger news affiliates that are included in the iQ media database. It is possible the show aired on smaller stations, like CW or MyNetwork affiliates, or on digital-only subchannels, both of which cater to smaller audiences. On April 10, Bolling promoted  the show on Twitter, telling users to “check your local listings.” The replies are largely from accounts saying that they couldn’t find the program. The local Washington, D.C., Sinclair station, WJLA, aired Wheel of Fortune during the 7 p.m. hour that night. For months before the premiere of America This Week, Bolling had been hosting ongoing  town hall  programming  for Sinclair focused on opioids, including one in which he interviewed  first lady Melania Trump. He was also beginning to make appearances on other Sinclair national programming  as a “political anchor ,” and he interviewed  both  President Trump and Sen. Ted Cruz (R-TX) on behalf of Sinclair in recent months. Bolling was a major voice pushing the racist birther conspiracy theory about Obama. He even examined  Obama’s birth certificate on the air, speculating that the certificate’s border showed it may have been photoshopped. He lectured  “rappers,” saying that they should be happy because white people are “financing their lifestyles” by buying their music. Bolling criticized Obama's leadership by claiming  the first Black president was "chugging a few 40s" instead of doing his job. When Gabonese President Ali Bongo visited the White House during the Obama administration, Bolling characterized it  as "a hoodlum in the hizzouse." He has also argued  that “there’s no racial aspect of [police] profiling” and said  that racism doesn’t exist anymore. Former Fox contributor Sebastian Gorka , an anti-Muslim extremist and Washington, D.C., swamp creature, recently officially became  a Sinclair contributor as well. 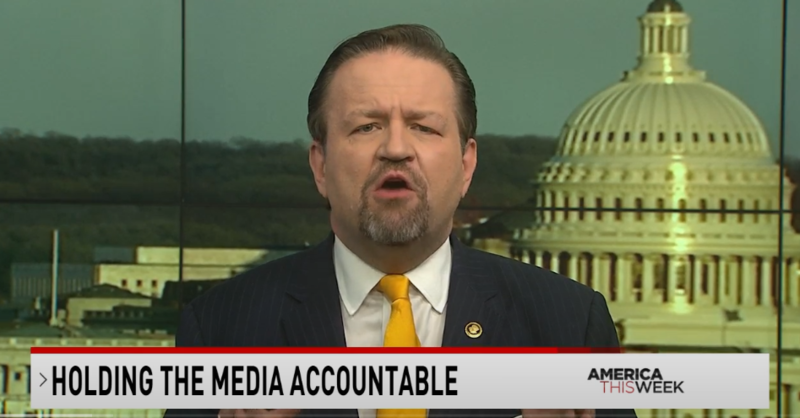 Like Bolling, Gorka had appeared multiple times in Sinclair national news programming beforehand, and he also hosted at least two special programs  that aired on Sinclair local news stations. One of these specials, called The Rise of Terrorism: A Clash of Cultures, featured footage labeled as "ISIS propaganda" and shots of terror attacks followed by Gorka asking viewers, "Can the teachings of Islam and western values ever be reconciled? Is it possible for the waves of refugees arriving in the west to assimilate and coexist peacefully?" Sinclair investigative reporter James Rosen also joined  Sinclair this year; he previously worked  as Fox News’ chief Washington correspondent before leaving the network in early 2018 amid reports that he sexually harassed colleagues. Before the broadcasting giant began airing  Trumpian “must-run” segments warning of media bias last spring, Sinclair stations were already running  multiple commentary segments featuring what were clearly right-wing perspectives, producing  fearmongering “Terrorism Alert Desk” segments, and broadcasting weekly shows from conservative conspiracy theorist Sharyl Attkisson  and right-wing grifter Armstrong Williams . In recent months, Sinclair finally brought a liberal commentator  on board to produce “must-runs” from a different point of view, but the company simultaneously invested in Rosen, Gorka, and Bolling.